The analog/digital inputs on one module can be replicated on the other module (and vice versa)-ideal for stand alone valve control or simple retrofit applications. Operates as a remote node with a standard SignalFire Gateway. All IO data is available at the Gateway as Modbus registers. Supports Modbus writes to control the analog and relay outputs. 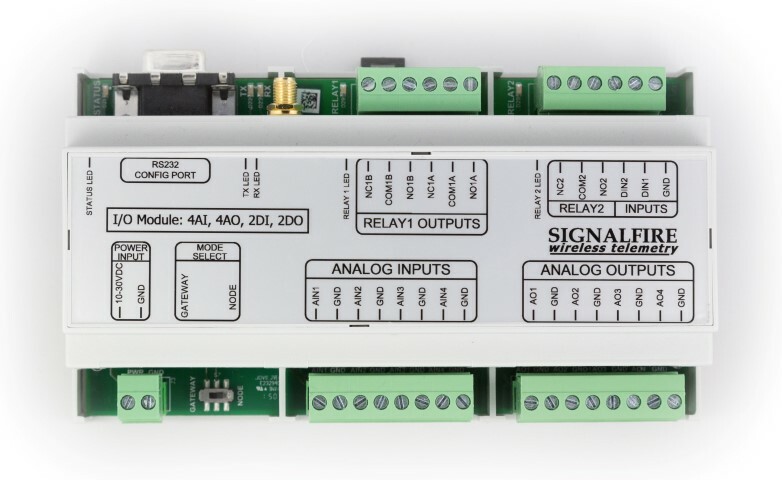 The SignalFire Wireless I/O Module acts as a wire replacement that replicates analog and digital signals over a wireless link between a pair of Wireless I/O Modules. The modules are DIN rail mounted and designed to be easy to use. The Wireless I/O Modules can also be used with a standard SignalFire Gateway.